The longer you train, the harder it gets to make true performance breakthroughs. The body adapts to training load the same way it adjusts to a new drug, gradually needing a little more with every “dose”. Many amateur cyclists assume they hit their ceiling of potential due to daily time limits or age. In my coaching experience, this is only sometimes true. Most athletes have greater potential than they realize, and only need to adjust their dose (and subsequent recovery) by increasing training density. This is almost always done without increasing weekly training time, and in fact, often comes with a total reduction. Perform the following thought experiment. Is doing one 20min interval once each week, at 95% FTP, enough to increase FTP? My answer is a firm “no.” Doing one day of 2x20min intervals will likely be better, 3x20min even better than that. Doing 60 minutes of FTP training per day is almost definitely better than doing only 20 minutes. We can manipulate the frequency of training sessions per week in the same way. Two days of training is better than one; three days is better than two. What must be taken into serious consideration is an athlete’s time, motivation, and ability to recover. We cannot take the thought experiment to extremes and have anything but a recipe for overtraining. But what point is extreme to a given athlete? As a coach, one of my primary goals in individualizing training plans is sneaking up on the optimal density for each athlete without getting to overtraining. Let’s look at scientific evidence to back up our conclusions from the thought experiment. These will provide reasonable places to start looking for the right training density. In a study by David Montero and Carsten Lundby (2017), a large group of young men was divided into subgroups and trained two, three, four, or five times per week for a total of 60, 120, 180, 240, and 300 total minutes per week. They alternated high intensity and steady moderate intensity exercise sessions. After the first training cycle, any “non-responders” who did not show improvement of aerobic performance completed a second training cycle where they added 120 minutes of exercise per week. 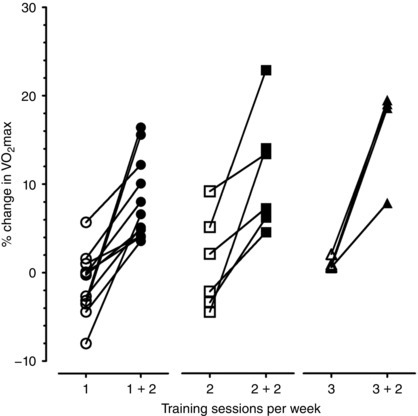 In the graphic above we can see that additional training stress of two hours per week evoked a training response in those who had not responded to 1, 2, or 3 training days. The authors found the individual doses needed for all 78 participants to increase their VO2max! The takeaway is that if you’re not seeing results from your current training schedule, increase your training density by adding another day or two of focused workouts. This increases the dose your body experiences and will drive greater adaptation. A valid criticism of the above study is that the authors intentionally sought out untrained subjects to control for baseline fitness. Trained cyclists can still use these lessons when combined with a practice known as block training, where the same or similar workouts are performed several days in a row. 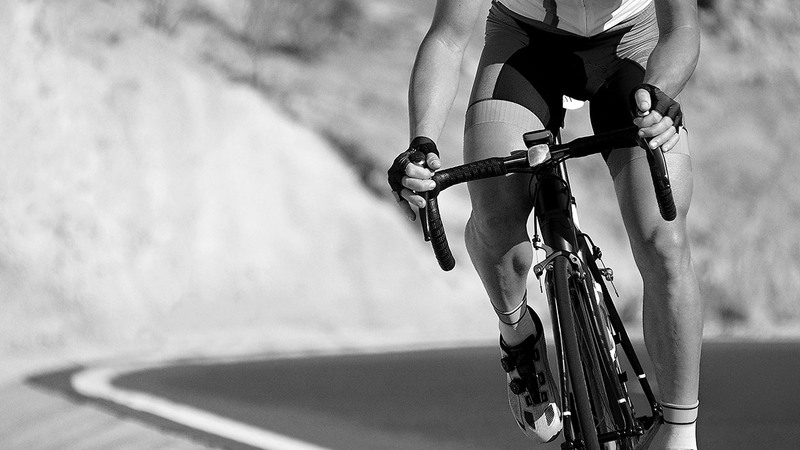 In a study by Rønnestad, Hansen, and Ellefsen (2014), trained cyclists performed two different training interventions. In the traditional periodization group, two weekly high-intensity training (HIT) days were interspersed with lower intensity riding for four weeks. The block training group (the full 4-week cycle is called block periodization (BP) in the study) group performed five HIT sessions in the first week followed by three weeks of only one HIT session per week along with otherwise low-intensity riding. The results of this study showed a statistically significant increase in VO2max for the block trained group both over baseline and over the traditionally trained group, but no significant increases in the traditionally trained group. This is despite everyone in both groups doing the same eight total HIT sessions over four weeks. A greater density of training was much more effective. 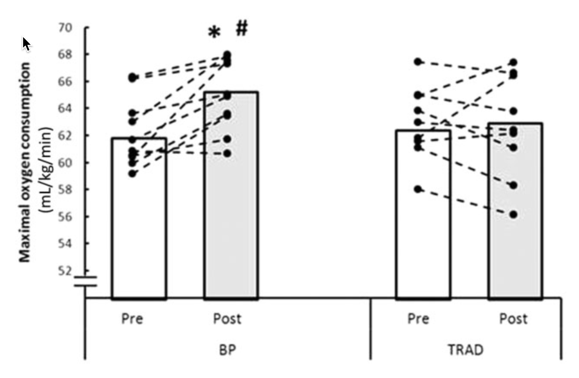 It is also safe to assume that for the two subjects in the BP group that did not show a large increase, it is likely they would have seen a response by increasing training density (adding more workouts) in the subsequent three weeks after the block training week. This summer I began coaching a cyclist who felt he wasn’t in great shape but wanted to be in good form for a stage race in seven weeks. After a long discussion about his training history and looking at his training load from previous years, I got a feel for how much he could handle in a block. I started him on two weeks of vo2max work before switching to a high-density threshold training plan. We stayed in daily contact so I could monitor his fatigue levels and adjust the schedule if needed. Tuesday’s “Threshold 1x” was an FTP tests where he did 252w for 61 minutes. As the saying goes, “training is testing and testing is training,” so we used this test to kick off a three-day block of sweet spot work around 230-240w. This made a total of four days threshold work. Three days of easy or recovery riding or resting were necessary before another three days of sweet spot work. A very dense two weeks capped off with his second FTP test, titled here “100% FTP.” He managed 281w for 53 minutes for a 29w gain in threshold power! This was a great result, and after some rest it was time to switch gears to race-specific training. Gradually start grouping workouts on consecutive days. If you’re doing two workouts in a row before an off or low-intensity day, shuffle around a workout day and a rest day to put three in a row and two rest days in a row. In addition to ensuring adequate sleep and nutrition, be vigilant of signs that you need an extra easy day. Always err on the side of more rest. I always make sure to test people often to ensure that the training is working and to get a sense of when someone has their best days. This does not even have to be an FTP or VO2max test. Some tests are a workout of just one interval held below FTP until exhaustion. With great training stress comes great recovery. An athlete’s nutrition and sleep become more important than ever when recovering from training in greater density than they’re used to. It can limit the number of days in a row someone can train, and how long it takes to recover from a block. The more you’ve trained, the more you can train. This is where individualized training plans make a big difference. After three or four weeks of dense block training, a solid week of easy and fun rides (and for off-road riders, technique work) will ensure readiness for the next block.